I realized last weekend that our current family tent was just too unwieldy for me to manage solo on the playa. That and it has a vast amount of mesh that needed covering to inhibit dust invasion. 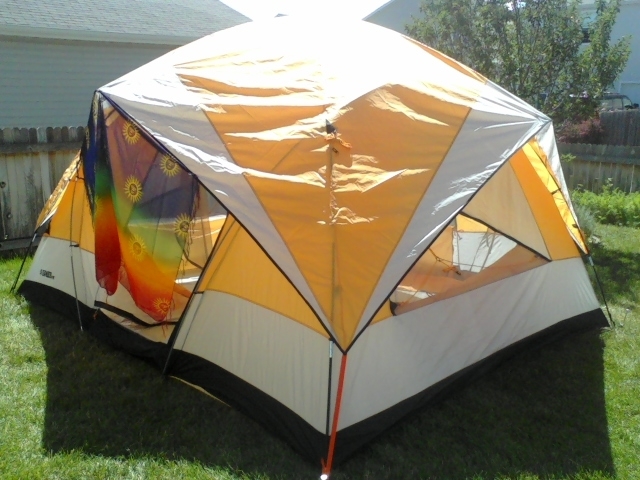 So I ventured out to Gander Mountain and procured a Grizzly Den 8 Dome Tent that has an amply high center ceiling with the added bonus that all mesh areas have fabric zipper closures. Only the bottom edge of the two roof triangle mesh areas were loose, so I cut thin strips of fabric batting and safety pinned it between the outer mesh roof and inner loose flap. That’s about as good as it’s going to get absent a hermetically sealed plastic bubble. The front door is decorated with a colorful scarf I picked up at Goodwill midweek as well.